New home sales rebounded in the Inland Empire in 2012 and 2013, only to fizzle in 2014 and into mid-2015. What happened? After massive job losses during the late-2000s downturn, positive job growth resumed in the Inland Empire in 2011. By mid-2012, new home sales were recovering, and builders were able to raise prices thanks to a severe undersupply of new and existing homes available for sale. Total new home sales continued to rise in 2013, while the number of new home project openings did not keep pace with demand, translating into rising project-by-project monthly sales rates. Strong sales enabled builders to further push prices dramatically to preserve inventory and increase margins. By 2014, things started to fall apart. The monthly cost to own a home increased 40% from 2012 to 2013 due to rising home prices and a spike in interest rates in 4Q13. Housing affordability eroded quickly. On top of that, the FHA lowered the loan limit for Riverside and San Bernardino in January 2014 from $500,000 to $355,350, knocking many would-be buyers out of the market. 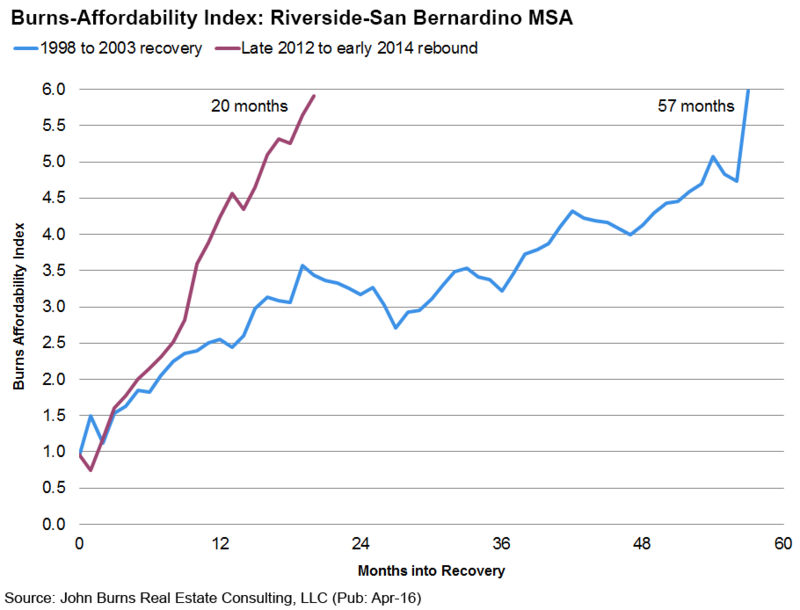 According to the Burns Housing Affordability Index*, the Riverside-San Bernardino market went from a 1.0 rating in August 2012 (extremely affordable) to a 5.9 (unaffordable) in a little over a year and a half. By comparison, in the last housing market recovery starting in 1998, it took 57 months—or almost five years—for the same amount of deterioration in the affordability index. The rapid decline in affordability in 2013 and into 2014 was too much for the market to bear. New home sales activity declined 5% in 2014 after having increased 27% in 2013. The decline in sales in 2014 carried over into early 2015. At the same time, the new home supply was finally increasing, eroding pricing power and causing many builders to adjust pricing downward or increase incentives. During the 1998–2003 housing market rebound, new home sales increased every year for five straight years (and actually continued rising for another two years beyond that); with an average increase in sales of 16% per year. Home sales in 2003 were 178% higher than when the recovery began in 1998. The slower decline in affordability was able to be absorbed by the market with no loss in sales momentum. Now some good news. While 2015 was an adjustment year, the fact is that with some pullback in net pricing, stable interest rates, and rising income levels (due to continued job growth and declining unemployment rates) affordability actually improved in 2015 (average Burns Housing Affordability Index™ of 4.4 in 2015 compared to 5.6 in 2014). Improved affordability brought more buyers back into the market, and by the 3rd quarter of 2015, year-over-year sales were starting to rise again. 2015 ended up with the highest number of new home sales since 2009, and sales continue to rise in 2016, keeping pace with new project openings. As of February 2016, the Burns Affordability Index for the Inland Empire was at just 4.5, indicating that the market is now slightly more affordable than average. So far, rising sales indicate that the market is keeping up with a rising supply of homes. If supply and demand can remain in relative balance, that should translate into more modest price increases and, hopefully, a sustainable increase in new home sales activity over the coming years. A careful understanding of market supply and demand conditions and how those factors can impact a specific project location can make the difference between a successful new home project and an unsuccessful one. Pete Reeb has been providing market advice to home builders, land developers, and investors for over 30 years and leads a team of experienced consultants ready to work with you on your next real estate deal. *The Burns Affordability Index is on a scale from 0.0 to 10.0. A value of 0.0 represents the most affordable time in history for that market, a value of 10.0 is the least affordable, and 5.0 is the historical median.